Two undergraduate programs in the College of Visual and Performing Arts’ (VPA) Department of Design have been ranked among the top 10 in the nation in the 2014 DesignIntelligence report “America’s Best Architecture & Design Schools.” DesignIntelligence is the Design Futures Council’s bimonthly report on the future, delivering original research, insightful commentary and instructive best practices. 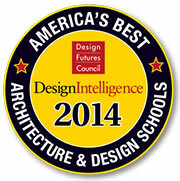 VPA’s industrial and interaction design program was ranked No. 3 in the nation for undergraduate industrial design programs and No. 1 in the east region. The college’s environmental and interior design program was ranked No. 8 in the nation for undergraduate interior design programs and No. 5 in the east region. The east region encompasses Connecticut, Delaware, Washington, D.C., Maine, Massachusetts, New Hampshire, New Jersey, New York, Pennsylvania, Rhode Island and Vermont. The industrial and interaction design faculty includes Fathers; Denise Heckman, Kathleen Brandt, Don Carr, Jonathan Mills and John Truex. The environmental and interior design faculty includes Sarah Redmore, program coordinator; Dennis Earle; Jennifer Hamilton; Lucinda Havenhand; Zeke Leonard; and Ruth Westervelt. The DesignIntelligence study ranks undergraduate and graduate programs from the perspective of leading practitioners. Selected professional practice leaders with direct experience hiring and supervising the performance of recent architecture and design graduates are invited to participate in the research. Survey participants, who are drawn from a database of leading firms throughout the United States, were asked the question, “In your firm’s hiring experience in the past five years, which of the following schools are best preparing students for success in the profession?” They were queried about such additional issues as how programs rate in teaching various skills.